Our Taichi started his training at TK since he is 6 months old. From mastering the down command to heeling during walks, from the Inappropriate interaction with people to have a good solialization skills… Don progresses the training at Taichi’s pace and takes time to impart the lessons so that Taichi really does learn. We will continue to come to Don’s class and would like to recommend this school to you too! 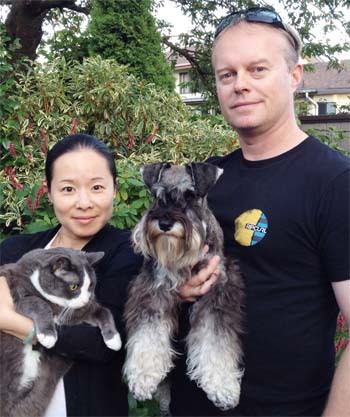 Rachel and Michael and their Schnauzer "TaiChi"
Janny and Laurance and thier Y/Lab "Mallo"
Ying Ying started her first obedience class just a few days after she arrived to our home. She was 3 months old back then, and we were excited to see that she quickly learned various commands such as ‘sit’ and ‘down’. We were very pleased with her improvement after she completed the intermediate level obedience classes, where she learned to follow commands even when she is off leash. 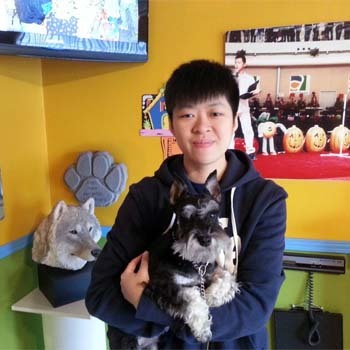 These classes were really helpful so that Ying Ying learns to follow our instructions, and she can play with other dogs in a fun and safe way. Ying Ying will soon begin her first agility class and we can’t wait to see her tricks and moves! April & her Old English Sheep "YingYing"
Emily & her Schnauzer "Mickey"
I brought my Doberman Bobby for training at TK since he was three months old. Bobby is a typical Doberman,VERY energetic, ALWAYS eager to play and RARELY willing to listen. We attended all the obedience classes, agility classes and we also attended the social classes every Sunday. It was A big challenge for us especially when we are a first time dog owner. Fortunately, we have Don! With his teachings and all of kind of informative advises, we gradually “transformed” Bobby into one of those “ROLE Model” type dog. With the Obedience classes, Bobby learns all different commands and with the Agility Classes, Bobby gets the chances to drill out the excessive energy and to practice on follow our commands more accurately! The social classes also helped him to properly “interact” with different dogs and people and helped him to learn to calmly react to any kind of media/environment.Bobby now is 13 years old. He is a calm submissive Doberman and always get very good comments from people when I take him out. People are always so surprised to see how gentle he is esp when he is such a powerful breed and I always tell them that Bobby is a proud student of TK canine.Thank you Don for transforming Bobby into SUCH a sweet heart to my family and everyone I know! I would highly recommend TK Canine Training Centre for anyone who owns a dog and wants the best for the Lovely pouch! Sarah & Tim & Schnauzer "Oyster"
We adopted Lok Lok when he was 4 years old. Back then, we had little control over his behavior! Taking him out for a walk was stressful, because he was constantly dragging the leash and was not friendly to other dogs. He would even do dangerous things such as running out onto the streets just to chase a plastic bag! We tried another dog training place, but had no luck until we met Don at ‘TK Canine Training Centre’. Ever since then, we noticed gradual improvement in his behavior. Now, Lok Lok is kind and patient, and can join dog parties off leash! Lok Lok’s personality changed so much that many of my friends find it hard to believe that he’s the same dog we adopted. We wouldn’t have such a great time with our dog without Don’s help. Don is skilled and konwledgeable about dogs and their behavior. We’ve learned a pleasant and positive way to train Lok Lok. At the same time, Lok Lok also really enjoys the weekly social lessons. Don is fantastic and I highly recommend him! 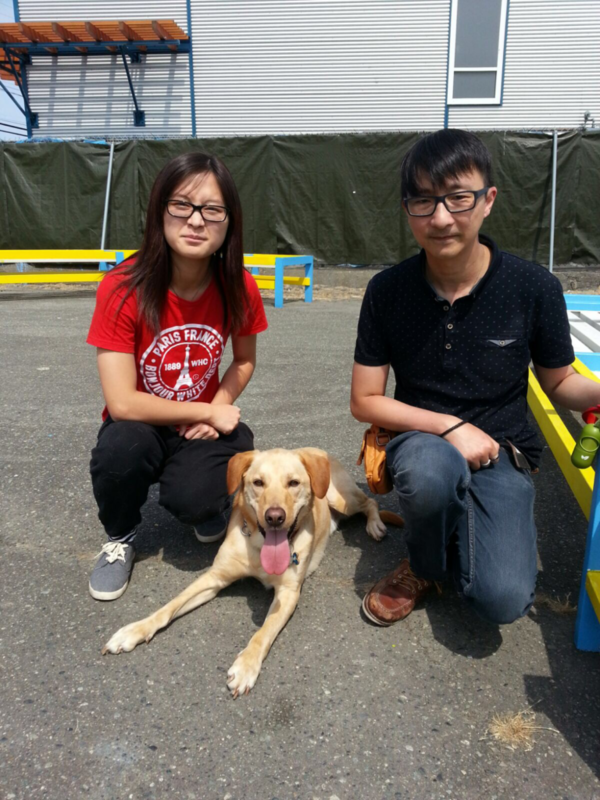 Mrs. Leung & her OESD "Lok Lok"
Yogi is a Yellow Labrador Retriever, first time when I saw him, I feel he need a home. Therefore, Yogi and me never leave each other. I took Yogi to Don’s Training School, let him have chance to learn more things, and learn what is the right socialization, teach him how to play with other dog and people, after training he become a well behaved. I also learn from Yogi, he let me know love and patience is important between people and people. So, Thank you so much Don. You teach me a lot! Thanks Again. Nancy & her Y/Lab "Yogi"
We knew we would face a lot of challenges in training our puppy when we decided to have a Shiba Inu. It is not the easiest breed to train after all. After Toshi had all his necessary shots at four and a half months old, we brought him to Don and we never look back. Don is a remarkable trainer. He customizes his training to our concerns and specific to Toshi’s behaviour . Right from the get-go, Toshi already complied with Don’s instructions at the first class. Throughout the basic obedience training class, we learned basic commands so that we’re able to interact with Toshi in positive ways. Within a very short time, he no longer displayed undesirable behaviours such as chewing the furniture or going upstairs (we decided it is off-limit to him). 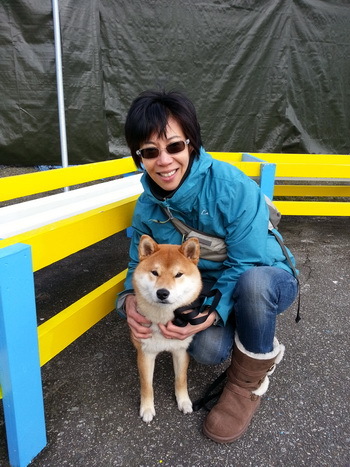 Besides the obedience training, Toshi has been going to the social class. He has come a long way in terms of interacting properly with other dogs of different breeds and age. Toshi is at the intermediate obedience training class now. He looks forward to every class and so do we. Don is not just a great trainer, he also provides great resources when it comes to grooming and taking care of Toshi. Going to T.K. 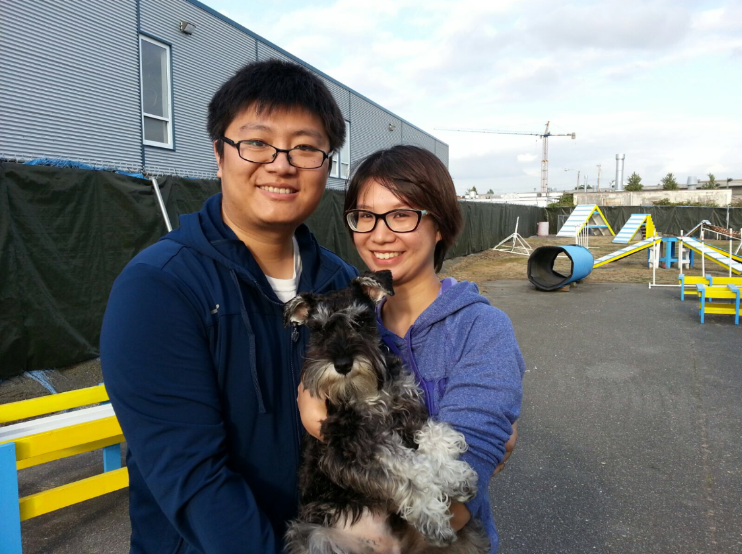 Canine Training Centre is one of our best decisions we’ve ever made for Toshi. 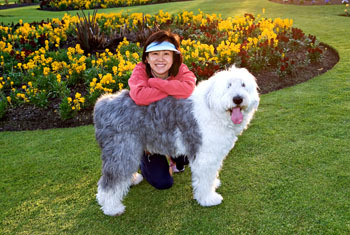 We recommend Don to every owner who wants to have nothing but the best training for their pets. Winnie & her Shiba "Toshi"